Planescape: Torment is a PC role playing game based on the Advanced Dungeons and Dragons (AD&D) tabletop rules. It came out in 1999, and it is played from an isometric (fancy for “top-down”) view. It is a point-and-click turn-based game set in a weird fantasy universe. 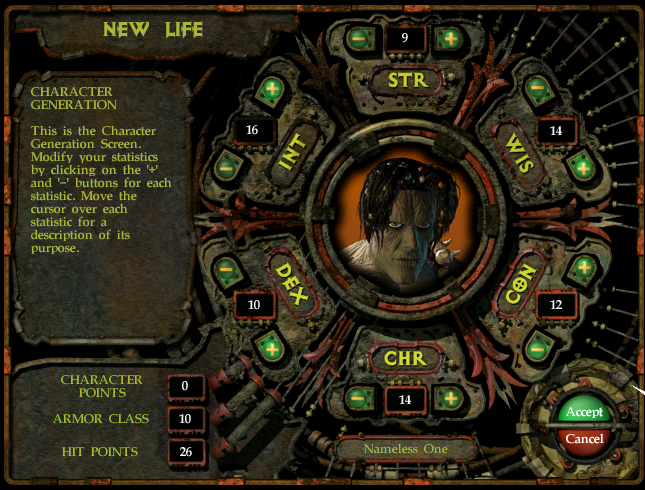 I am writing a “Let’s Play” style series about Planescape: Torment from beginning to end. I learned about it from Jeremy about ten years ago, when we found out we both liked the Baldur’s Gate series of PC games. I know Baldur’s Gate very well, but I’ve never played more than a few hours of Torment. So why not write about Baldur’s Gate? Because there’s less room for surprise and exploration; because Jeremy once lent me his ancient, battered cd before digital downloads became common, which is a hell of a recommendation; and because of what Planescape: Torment is about. It is about an immortal with amnesia and his best friend, a floating, talking skull. They have strange encounters with alien species, and the game encourages talking, exploration, and moral choices over fighting. It’s Doctor Who if Edward James Olmos played the Doctor. Which is how I’ll play the game as well, doing my best to make good moral decisions (tempered by a roleplayer’s greed) and choosing to help rather than to harm. The Ultimate WeiDU Fixpack – this fixes a number of bugs and helps prevent crashes. Qwinn’s Unfinished Business – restores content to the game, including quests and dialogue, that was abandoned by the developers due to time or budget problems. Bigg’s Widescreen Mod – allows me to adjust the resolution of the game so it won’t appear so pixelated. When I originally installed the game it displayed only a few feet around Nameless. With this mod I get a much broader look at the surrounding area, and a feel for the scope of the setting. Ghostdog’s UI Mod – fixes all the bugs introduced by the widescreen mod and smooths out the user interface for an easier player experience. 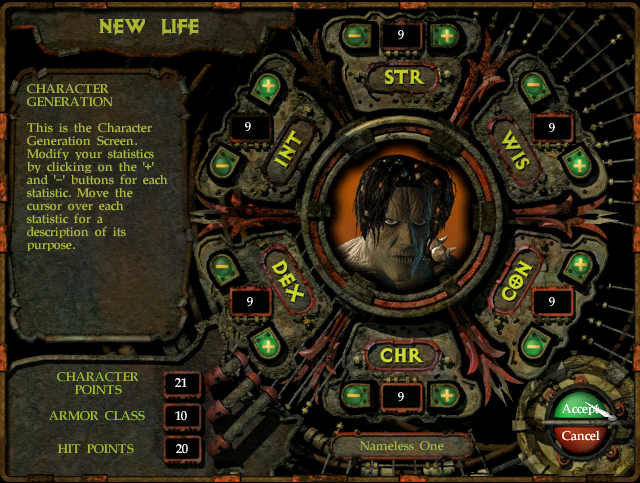 Although it’s based on AD&D, Planescape: Torment is a weird game, so I’m going to add some explanation of how it’s played, what certain terms mean, and how I made my character. Thankfully, unlike Baldur’s Gate, the character creation system is simple and easy to understand. You could grate a mountain on that mug. Surrounding him are his stats: Strength, Wisdom, Constitution, Charisma, Dexterity, and Intelligence. These are increased by using Character Points (in the lower left) and, depending on what I choose to improve, effect the Armor Class (AC – how hard Nameless is to hit) and Hit Points (HP – how many hits he can take). I’ll let the manual explain the individual stats, because I miss the times when games came with manuals that added to the story or the world. “There are six primary stats that determine what kind of person the Nameless One is – smart or stupid, strong or weak, agile or clumsy. I have 21 character points to increase them. Though some control his mental faculties, they do not affect his morality or alignment. Strength (STR) – This makes you a good fighter. If you want to be a real meat grinder of a warrior – raise your Strength score. Constitution (CON) – This stat makes you tough to kill, almost always a plus considering how many people are trying to off you. One other bonus of a high Constitution is that you’ll regenerate faster. Dexterity (DEX) – This stat determines how difficult you are to hit, as well as how fast your reactions are. If you want to get the drop on your foes before they raise the alarm, high Dexterity helps. Intelligence (INT) – The smarter you are the more witty things you can think of to say. Having a higher Intelligence stat gives you more dialog choices, access to more spells, and a better chance to regain memories. Charisma (CHR) – A high Charisma stat means that people are more likely to listen to you, and even believe what you say, you’re so convincing. A high Charisma allows you to successfully bluff people more frequently. Okay, but how do I know what to pick? The obvious solution is to be a beefy strongman, since Nameless always starts as a level 3 Fighter, but only a level 1 Mage and Thief. He also can’t use his Mage or Thief abilities until he finds a teacher. But the manual has a bit more to say about this world and how we can best get along in it. Okay, that clears things right up. Intelligence, Wisdom, and Charisma, in that order, seem to be the most important stats. I need them to solve the puzzle of Nameless’ identity and purpose, and to get more people on my side and helping me. I also want Constitution since I’m otherwise a weakling. I thought for a long time before deciding to sacrifice a higher wisdom for constitution. I’m almost helpless physically, and I don’t know where to find someone to train me to be a wizard. Until I do, expect a lot of running away or bargaining. That’s all it takes to begin a game. Next time, I’ll recount Nameless’ first adventure. If you have any questions or comments put them in the comments below, and if you have any spoilers put them back in your head and keep them there. No spoilers, please. This entry was posted in Games, William Hohmeister and tagged Entertainment, games, geek, Planescape, Planescape: Torment, role playing games, RPGs, The 90s, Video Games by Sourcerer. Bookmark the permalink. …will check out that “Good Old Games” website! I don’t have any experience with it myself, but I rather trust Will’s judgment on these things. Am thinking about going and seeing if they have X-Com, myself. I just love that good old game. Planescape: Torment (and Icewind Dale, for that matter) fell into a little hole in my life where I wasn’t gaming very much. I have it on my laptop but only got a few hours in. Sooner or later I’ll take a better stab at it.